In 1768, Theophilus Anthony of Manhattan came to the Long Lake area and built the first “summer camp” at what is now called Anthony Ponds near Long Lake. Amazingly, there was a New Yorker’s vacation home at Long Lake about sixty-six years before the first settler. The issue of slavery was a difficult one for the Methodists in America. Methodist founder John Wesley had a great distaste for the institution and preached its evils during his ministry. The church’s General Rule on Slavery (1789) forbade the buying and selling of slaves, although not slave holding. Many southern Methodists moved north to distance themselves from the institution, but just as many felt that although distasteful, the question of slavery was a political and economic problem, not a religious or moral one. In the 1840’s Methodists ardently opposed to slavery pulled away from the church because it would not take a stand against slavery. They called themselves Wesleyans, harkening back to John Wesley’s abhorrence of the institution. The group had both white and black members who worked together with the Anti-slavery Friends, providing safe haven for runaway slaves who passed through the area. After the Civil War, the group worked tirelessly for prohibition and in 1892, a Wesleyan minister was a candidate for governor on the Prohibition ticket. By the late 19th century the Wesleyans had joined in the Holiness movement and their services were filled with great emotional outpouring of music, dancing, and spiritual zeal. On May 31, 1843, thirty-five ministers and one hundred and seventeen laymen from nine states and Ireland met in Utica, New York. The president of the Champlain Conference, the Reverend Cyrus Prindle, offered the opening prayer of the Utica convention. They organized the Wesleyan Methodist Connection of America consisting of six conferences: New England, Champlain, New York, Allegheny, Miami (in the state of Ohio) and Michigan. The Champlain Conference was one of the first Conferences of the Wesleyan Methodist Church. In May 1843, between the Andover and Utica Conventions, the Champlain Conference was organized. The Champlain Conference, at its first session after organization, included eighteen churches with one thousand and fifty-eight members. Disputes over slavery placed the M-E church in difficulty in the first half of the 1800s, with the northern church leaders fearful of a split with the South, and reluctant to take a stand. The Wesleyan Methodists and the Free Methodist Churches were formed by staunch abolitionists. The Free Methodists were especially active in the Underground Railroad, which helped to free the slaves. In the 1840’s and 1850’s many individuals and families left the Methodist Church to become Wesleyan Methodists. This split in the church was primarily a result of the slavery issue. Those who embraced the Wesleyan Methodist Church felt that the stand taken against slavery by the Methodist Episcopal Church wasn’t strong enough. The Underground Railroad, a network of proactive people opposed to slavery prior to the Civil War, was quite active in New York’s Capital District. The area was a major location for helping funnel runaway slaves north to their freedom. While many in the Underground Railroad did their work behind the scenes, research from groups like Albany’s Underground Railroad Workshop and others are revealing that many of the participants were quite “public” about their work. Albanians participated in the movement and included Reverend John Sands of the Second Wesleyan Church (African) of Albany, NY. Finally, in a much larger split, in 1845 at Louisville, the churches of the slaveholding states formed The Methodist Episcopal Church, South. In addition to the United Methodist Church, there are over 40 other denominations that descend from John Wesley’s Methodist movement. Some, such as the African Methodist Episcopal Church, the Free Methodists and the Wesleyan Church, are explicitly Methodist. Others do not call themselves Methodist, but are related in varying degrees. The Salvation Army was founded by William Booth, a former Methodist, and it derives some of its theology from Methodism. Another related denomination is the Church of the Nazarene. Some of the charismatic or pentecostal churches such as the Pentecostal Holiness Church and the Assemblies of God also have roots in or draw from Wesleyan thought. There was great rivalry between the followers of Wesley and the Baptist followers. On one occasion, Elder Culver delivered a scathing attack on his opponents but finally cooled down and said the Methodists were doing some good; they held the same relation to the Christian Church, that the swill barrel does to the farmer’s kitchen, receiving the rejected offal that was only fit for the hogs. David Keller, James Sargent, Owen Skinner, Zenas Parker, Joel Plumley, and John Cunningham are considered the first settlers. William J Austin moved into Long Lake about 1840 from Vermont. He made a small clearing half a mile from the Mill at South Pond on a high ridge, built a frame house 20 x 26, a regular farmhouse, and raised it himself. He was a large, powerful man and a good mechanic. He and his wife raised three children while in Long Lake and then moved to Moriah, Essex County. The 1840 census shows him alone, age 20 to 30 years. However in 1841 he is one of nine families living in Long Lake. He was Long Lake Town Supervisor; his term was 1842-1843, again in 1846. In 1849 C. W. Weber, the “Sporting Naturalist,” wrote of his visit in the publication, The Spirit of the Times. He stayed at the lakeside home of thirty-five year old William Austin, whom he described as “a rather tall, large and very muscular man, quiet in his manners and not much possessed of the ‘gift of gab.’ Austin’s log house was described as moderately comfortable, setting on some 18 or 20 acres of cleared land. His log barn was without stalls and harbored a yoke of oxen. Mrs. Austin was “a short, stout, good-natured kind of body, about his age, and equally quiet.” William and Lois Austin were the 2nd great grandparents of Reverend Harold Austin, Jr., father of the current pastor of the Long Lake Wesleyan Church, Kevin Austin. William and Lois Austin’s son Ferrand Austin was mentioned 1n 1881 as an Adirondack Guide for the first time and he was a member of the Wesleyan Methodist Church. He also was a member of the Adirondack Guide Association in 1891. Mitchel Sabattis was a noted Indian guide who figured extensively in all histories of this region and deserves more than a passing notice. He was born at Parishville, St. Lawrence County, September 29, 1823, a pure blood of the tribe of St. Francis. He early took to the woods as naturally as a duck to water. Following the death of his mother when he was seven years of age, his father, “Captain Peter,” used to take him along on his various hunting and trapping expeditions. Mitchel was earnest, intelligent and thrifty, a member of the Wesleyan Methodist church, and an authority for many things relating to Indian history. Mitchel Sabattis attended school in Long Lake for a short time in 1841, when the area school first opened. In July 1842, Betsy (Elizabeth Ann) Dornburgh enrolled in the school and remained for two years. She married Mitchel Sabattis. She was a fair German woman, the mother of thirteen children, unmistakably marked with Indian blood, according to Benson J. Lossing, author of The Hudson from the Wilderness to the Sea. (1866). All the family was greatly involved with the Wesleyan Church. Reverend Chittendon, who visited these parts met Mitchel at the time he was about to lose his home because he got drunk often, could not earn a living, and could not make the payments on the house. Reverend Chittendon paid the rent and in gratitude, Mitchel Sabattis promised to leave whiskey alone. He became a changed man and a good Christian, and later in 1862 desired to help build a church here. According to Ruth Timm, author of North Country Tales, Truths and Trivia, “Sabattis … took a lively interest in the religious affairs of the town.” The Reverend John Todd, who brought the first formal religion to Long Lake, published his book, “Long Lake” in 1845. He organized the first church in Long Lake, the Congregational Church, but no building was ever constructed. They met for a few years in an old log schoolhouse and also in some building on Bluff Point. It was here where his “young friend Sabattis” as a young Indian man led the music in public worship with his violin. The name of Mitchel Sabattis runs through the history of the church. He went out and personally solicited people he had guided in past years, preached in various churches, and came back to Long Lake with some $2,000.00. In 1846, the Raquette River and its branches were declared a public highway open to log transport and William Wood and Matthew Beach settled there at Raquette Lake. On November 5th 1839, Matthew Beach and William Wood were Commissioners of Schools at Long Lake. In August 1846 per Headley: “Although frostbite had caused Wood to lose both legs below the knee joints, the dauntless woodsman continued to run a trap line, hunt and travel using his knees as a substitute for feet.” His brother Josiah Wood with his wife and seven children joined him at Raquette Lake. Martha “Patty” (Culver) Wood, destitute after Josiah’s death in 1867, filed for a pension as a result of their son William’s death. He died in the Civil War near Petersburg, Virginia on the ninth day of July 1864 from a gunshot wound. The final organization of Hamilton County (as a county) was completed in 1847 and the separation from Montgomery County was concluded. Alvah Dunning, Game Constable for Long Lake, reported in 1854 the “petering out” of moose in the Raquette Lake area. John Jaques II introduced croquet to the world in England at the Great Exhibition in 1851. Then in 1855, the game of croquet was introduced to this area. Meanwhile the State of New York was changing the tax law to allow the purchase of Adirondack forestland at tax sales. One of the first Wesleyan Methodist churches in the Champlain District was the combined “Bridport, Vermont and Crown Point, New York Church with Calvin Goodwin as Pastor.” As for the Church at Long Lake, and according to legend, James Keller, was a praying man that desired a church here in Long Lake. While he was praying one night, John Lapelle entered the room, having walked from Crown Point some sixty miles away. God had been talking to Lapelle concerning a church in Long Lake. He had explored the ground the year before. He found no church in the place and no one in the town professing Godliness. In September, 1855 Reverend Willard Alden, and John Lapelle, both of the Wesleyan Methodist Church of Crown Point, Essex County, came by foot to Long Lake for the purpose of holding protracted meetings, currently called Revival Meetings. Reverend Alden, after a week spent in meetings every night and visiting from house to house every day, formed a class and on September 10, 1855, they organized a church with thirty-two members. Being desirous to keep up the class that he had formed and to perpetuate its existence as Christian, they hired Willard Alden as preacher for three years. He therefore went back to Crown Point and moved in his family as soon as possible. Elder Leonard Dolph, head of the Champlain conference, formed the original Wesleyan Methodist Church of Long Lake with about 38 people. The first Pastor, Reverend Willard Alden, born in West Salisbury, Clinton County, Vermont, came to Long Lake from Crown Point in Essex County by way of Parishville, St. Lawrence County. He and his family arrived in Long Lake in the 1850’s. His was one of thirteen new families arriving as a result of the increased mobility due to road building in this area. His wife, the former Alice M. Eggleston was mother of eleven children. She died at the time of or soon after the birth of their youngest child, Lee, in 1862. Reverend Alden then moved on, remarried and in 1880 was the Methodist clergyman in Franklin, Pa. The oldest of their children, a daughter named Philaotman Alden, age 17 was an original member of the church here, along with two other siblings, Emily A. Alden, age 15 and Cyrus W. Alden, age 10. The son Julius, born about 1856, died in 1860 and is buried in the Long Lake Cemetery. Cyrus moved away from Long Lake and soon enlisted in Company 11 of the New Hampshire Volunteers on September 2nd 1862. He was discharged on June 4th 1865, a veteran of the Civil War. The First Quarterly Conference of the Long Lake Wesleyan Methodist Church was held in connection with the formation of the church on Tuesday, November 13, 1855. Reverend Leonard Dolph in the chair, Willard Alden, Secretary. Arrangements were made for furnishing the preacher’s house and raising something to feed him and his family and to defray Brother Dolph’s expense from Port Henry. These Quarterly Conferences are now held annually or on call. For three years the church had quarterly meetings, then called conferences, and discussed church business, mostly relating to supporting the minister. Special meetings were called when needed. Lorenzo Bissell, born about 1844, at age 11 was one of the original members of the church. He was living in Newcomb near the Mitchel Sabattis family. He was the son of Charles Bissell and the grand uncle of Long Lake’s former Town Supervisor, Thomas T. Bissell. The next member of the original class was Betsy Ann Sabattis, age 46, about 15 years older than her brother Mitchel Sabattis at that time. She married David B. Catlin who left Long Lake after her death on December 30th 1882. Their daughter, also a member, was Phoeby E. Catlin; married to Darius B. Squires who later joined the Long Lake Wesleyan church and on April 13th 1865 stated that he desired to become a member of the church. He had come to learn our ways and see how we “done” business. Mr. Squires became prominent in public affairs. For nine years he was busily employed in official positions in Long Lake. He served with ability as Inspector of Elections, Overseer of the Poor, Assessor and Collector, Constable, Highway Commissioner, and Justice of the Peace in 1871. While here in Long Lake, he acted as Trustee, Class leader, and Superintendent of the Sunday school. He left Long Lake and went back to Schroon Lake where he was called to serve as Inspector of Elections, Constable, Chairman of the Town Committee, Justice of Sessions, and Justice of the Peace. He later conducted a profitable legal business in which he became proficient through his own exertions and natural capacity for study. He occupied a comfortable and pleasant residence, which he built in 1878 and he was the owner of a large law library. Craig Seaman, the current Vice–Chairman of the Long Lake Wesleyan church is the 2nd great grand nephew of his wife, Susan Seaman Squires. Leonard Frost, another original member, moved away from Long Lake and later died in the Civil War; he was in the 92nd Regiment, New York Infantry. No other information seems to be available regarding Mr. Frost. To place this into context, remember that this was one of the strong motivations of this time; the passionate stand against slavery provoked many Wesleyans to take part in what was a noble cause. Next was Sally Ann Furguson, wife of William Furguson and mother of four. Her youngest child, who died at the age of ten, was buried in the Long Lake Cemetery. William Furguson came to Long Lake in 1849, living there with his wife until after 1860 when she apparently died. He then moved to Lewey Lake to live with his housekeeper, the widowed Phebe Steves, until his death in 1881. It is three and one half miles from Deerland down stream to the school lot purchased in 1846 for district #2. Sargent lived on Lot #99, which is the outlet area of South Pond. It would seem then that the first district was on the upper end of the lake around Deerland. This did tend to be the more populated area, as Reverend Todd owned Lot #76 which is right across from Deerland. This school burned down after a fresh fire had been started in the morning and Cary did not go back to teaching. According to Robert Shaw, the Amos Hough’s family consisted of six girls and one boy, with Sargent having four children. Amos Hough’s wife Lavinia Salmon Hough was also a member at this time. On October 31, 1862, Brother Amos Hough was received to full membership, and then on April 15, 1865 he was chosen steward. April 20, 1866, Brother Amos Hough was arraigned for evil speaking, and expelled, by a committee composed of: John L. Boyden, John Lapell, Catharine Smith, Lydia Ann Seaman, and Alice Boyden. Then on September 23, 1868, they met agreeable to adjournment to investigate Brother Hough’s case. Brother Hough voluntarily stated the facts of the case, avowed his wrong and humbly begged to be forgiven. He was forgiven by a unanimous vote. While immoral conduct was unsettled on motion of Brother Squires, his name was returned on the church book as “withdrawn while under censure.” According to the Shaw record, he was of an unsteady turn of mind. He built as many as five houses while in town. Some of them were shanties. Besides that, he lived in some that he did not build. He at one time lived on Raquette Lake in the home occupied by Matthew Beach. The arrangement was for Hough and his son to take care of Beach for the rest of his life, yet the 1860 census shows Beach living with John E. Plumley as a boarder – and there was a Harriet Hough, age 16 also living as a servant with the Plumley family. Mr. Matthew Beach died in 1862. Amos Hough stated for the census that his occupation was a farmer but served as a first class guide. He, in his old age, moved to Iowa and after a couple of years came back and then went again to Iowa, where he died in 1862. His wife Lavina returned to Long Lake and died in 1882 and is buried in the Long Lake Cemetery. James Keller age 19, in 1850 was living with his sister Catharine, age 22, wife of Francis Smith. This is the same James Keller mentioned earlier, who along with John Lapell, helped bring the church to Long Lake. His wife, Esther G. (Seaman) Keller, mother of 4 was also an original member. Esther was the older sister of Ransom Seamans (1833-1868), great grandfather of Clifford Seaman. On September 24, 1861 James Keller was elected steward. Then on August 12, 1865, a committee was selected to go to Pittsfield, Mass and elsewhere to solicit funds to build the Church and on that committee was: Robert Shaw, Mitchel Sabattis and James Keller. April 15, 1865 he was chosen Class Leader. He took a letter of transfer on September 10, 1868 and went to Viola, Olmstead Co., MN. Miss Sabra E. Kellogg came to Long Lake, in 1843; she was the youngest child of William Kellogg, a girl of eleven years. On January 9, 1846 she was in School District 2, Long Lake – her teacher was her mother, Ruby Phelps Kellogg. She then became the wife of John Cassay. John Lapell was born in Canada. The family felt there was a prejudice against those coming from Canada, and it is said that many would lie about their birthplace, giving a United States birthplace. Oral family history states that the early LaPells considered themselves to be French -from France, and not French-Canadians. So, perhaps the LaPell family only had one generation born in Canada and quickly moved to Vermont. John was a very religious man who seems to have had a falling out with the Catholic Church. It is told by descendants of Mary LaPelle that the church was not willing to perform a mass or bury someone in consecrated grounds, as John could not afford the designated fee. This might be the funeral of his first wife Harriet Newell who was born and died in Shoreham, Addison Co., VT. After this, John made his whole family become Protestant. This probably started a family feud that carried the six brothers their separate ways. John knew families who lived in Long Lake, and he may have worked as a surveyor for New York State. John found the Long Lakers to be “ungodly hell raisers” and set out to bring religion to them. He married his second wife, Moriah Shaw about 1856. An original member of the Wesleyan Methodist Church, she was the daughter of George Shaw and sister of Reverend Robert Shaw. Then on December 6th, 1857 Sister Moriah Lapelle died after only 24 hours of illness. This caused great sorrow not only to her friends, but also to the whole Wesleyan Methodist Church. Her age was 19 years, four months and 2 days. Oral history tells us that Moriah was a very small woman, less than two pounds at birth and it is said that she never became full-grown. During the next year, John married his third wife and mother of all eight of his children. Lavina C. Van Valkenburgh was born on December 27, 1842, the first white female child born in Long Lake. She also was an original member of the Wesleyan Methodist Church. Just before the birth of their second child, on September 24th, 1861 John was elected steward in Wesleyan Methodist Church. On 25 September 1864 a motion was made and carried that a parsonage be built on Brother John Lapell’s land opposite the burying ground (later moved to the present Long Lake Cemetery). The size of the building was to be 38 feet by 32. A resolution was passed empowering the Trustees to build the house by the job or by the day, as they thought best. According to the deed, on 27 August 1889, the Trustees were Robert Shaw, Orello E. Boyden and John Lapell who bought land from Hannah Tarbell for the church. Hannah Tarbell is the second great grandmother of our David Lamos, owner of the Northern Borne Store in Long Lake and who resides on “Tarbell Hill Road”. In 1895, John Lapell was mentioned as an Adirondack Guide for the first time. John was considered to be a clairvoyant, and many people would come to him to get help on finding missing things. He would think about the article to be found overnight in his sleep, and tell the person where to find it the next day. Also, John was getting his third set of natural teeth when he died at 75 years of age. Many considered him to be a saint; he was always helping someone and was very religious. He also helped the Abenaki and Mohawk Indians in the area. John always left his home open for the Indians. Lavina would tell later of finding Indians sleeping by the fire in the morning, covered in bear fat to ward off the cold. She disliked the smell, but never said anything against the visitors. John always made sure the Indians had food to eat before they went back into the woods. During the summer, when John was off surveying, the Indians would come out of the woods, pick up gardening tools and weed the garden for Lavina. Then they would put the tools away and go back into the woods all without a word. John had the mail route to Blue Mountain where he would have to walk between the two settlements once a week, carrying a pack of mail. John Lapell died April 4, 1900. His obituary received from Grace Simonds of Shoreham said: “John LaPell, aged seventy six years, an old resident of Long Lake and much respected, died at his residence here last Wednesday at 11 pm after four weeks of extreme suffering, and of paralysis. He was an exemplary Christian, having united with the Wesleyan Methodist Church at the early age of seventeen years. He gave all that was brightest and best of his life to his Savior and the good work, which his heart was in. He came to this place from Vermont before he was twenty years old, and was a founder of the Wesleyan Methodist Church here, and had been a class leader for twenty or thirty years. In his long and weary sickness, loving hearts gladly ministered to every want. The funeral was held on Friday at 2 pm from the Wesleyan Methodist Church. The Reverend Robert Shaw officiated. The bearers were R. Town, James Cole, Frank Plumley, Ira Wood, Andrew Murray and R. Haitson. Interment was made in the Long Lake Cemetery”. John Lapell was the great grandfather to Lenora Seaman and Annie Sabattis. Mr. Andrew Mulholland arrived in Long Lake between 1845 and 1850 and in 1855 was an original member of Long Lake Wesleyan Methodist Church. In 1861 he was elected steward of the Wesleyan Methodist Church, but April 15, 1865 he was withdrawn under censure. August 10, 1865 the case of Brother Andrew Mulholland who had “indulged too freely in the use of alcoholic spirits, and gave away his giving satisfaction therefore”, was left to a committee of the Wesleyan Methodist Church. His wife, the former Christina Keller also was withdrawn under censure. B.B. Perry and Edgar Perry were original members, however no further information concerning them is currently available. After examination the charges were sustained. He, not being repentant was expelled. He served in the Civil War as a private in Co 174, 48 Reg. NYSV. He also served with William Wood in Co. E, 118th NY Infantry. His right thumb was shot off during his service and he was transferred to 144 Co., 2nd Battalion Veteran Reserve Corps in which he served until the close of the war. On January 2, 1871 he apparently was reinstated as a member of Wesleyan Methodist Church. In 1874 he was mentioned as an Adirondack Guide for the first time. Howard Preston in 1855 was an original member of Long Lake Wesleyan Methodist Church, later on trial and dropped. He lived near Fishing Brook with his father Edmund where they had a sawmill and were listed as residents of Indian Lake. In early 1855, Lewis Elijah, son of Sabael (the Abenaki Indian for whom the hamlet of Sabael was named), was guide for the expedition of William Coventry Waddell. They commented that the house of Mr. Preston was supplied with water brought by pipes from the hill behind it. It was surrounded by neat fences and looked thrifty and promising. The soil yielded abundantly. Then in July 1855, Henry J. Raymond in the New York Daily Times presented quite a favorable view of Long Lake and its people. He mentioned Edmund Preston and said that he was not interested in a mere self-sustenance nor was he interested in merely earning enough money to continue moving west. The appearance of his name on the Wesleyan Methodist Church Charter indicates that he was a man who sought to carry with him bits and pieces of New England life to be reassembled in the Adirondacks. An accomplished carpenter, Preston taught the trade to Reverend Robert Shaw. The family left town about 1869. James Rice in 1855 was an original member of Long Lake Wesleyan Methodist Church and in the 1860 census was living with Robert and Gitty M. Shaw while in school. He was in the Civil War in Co. K; 1st Regt. NY Heavy Artillery and is shown as Officer of the Day on the Adjutants Report of the William Wood Post #531 Grand Army of the Republic. He married Pauline Houghton and the record reflects occasions of difficulty with Sister Pauline Rice and on October 27, 1877 Sister Paulina Rice’s name was dropped from the Wesleyan Methodist Church Record. The Abram Rice family apparently was in some sort of trouble during the 1860s. Young Abram was with the David Keller family, James with the Robert Shaw family, David with Isaac Keller family, Malvina with the George Houghton family, John with the Almond Hough family and Lucinda was with Miss Sarah Perry. Abram Sr. died soon after and the guess is that during the 1860s his health was such that the family was broken up. David Keller with thirteen in his household was living in Root, Montgomery Co during the 1830 census. According to “Aber”, David and Harmon Keller came to Long Lake from Root. In 1834 the family relocated to Newcomb for a couple years until a suitable place could be made for them at Long Lake. At this time he cleared a site in the south west corner of Lot #72, and found Joel Plumley had already built a house next door to him on Long Lake and located on a previously occupied “farm” next to Plumley in the south west corner of Lot #71, next to the Stanton’s on the southeast corner of Lot #70 whose east line was close to the present bridge. In 1835 David Keller with his wife and daughters, nearly grown women by then, and a baby in the wife’s arms, left Newcomb. 1837 shows him as one of the first settlers of Long Lake. The 1840 census shows 14 total in the family with 4 employed in agriculture and 6 as scholars. In 1841 his was one of nine families living in Long Lake. On December 21, 1846 he is shown as a Trustee for School District #2 of Long Lake on the deed for the land on the north side of the lakeshore. The 1850 census lists him with his wife and 6 children, in Long Lake; the value of his real estate holdings was $600. The 1860 census showed him with his wife and three children plus Abram Rice, age 12 in school. At a Special Term of the Supreme Court, held in City of Johnstown, June 5th, 1959 – Honorable Willard L. Best, Justice of the Supreme Court, State of NY for County of Hamilton, dealt in the matter of the “application of Arthur Parker, Supervisor of the Town of Long Lake, Hamilton County, NY, for an order to remove the remains of David Keller and Christina F. Keller from the Keller Private Cemetery in said town and re-inter said remains in the public cemetery owned and maintained by the Town of Long Lake, and it was ordered that Sullivan & Minahan, Inc. Licensed Funeral Directors, 67 Park St., Glens Falls, Warren Co., NY shall have charge of the removal for a sum not to exceed One hundred dollars, etc.” David Keller is the third great-grandfather of our present Donald Florian Keller. Zenon Parker is shown as one of the first settlers of Long Lake. He came from Vermont. The 1840 census shows him alone and in 1841 as one of nine families living in Long Lake; from 1847 through 1848 he was the Long Lake Town Supervisor. The 1850 census shows him with his wife Rachel and three children. He was the 2nd great grandfather of Roberta and Cathy Parker. Ransom L. Seaman, great grandson of Benjamin Seamans born in 1740 in Swansea, Mass. married Huldah Catlin who was also an original member of the Long Lake Wesleyan Church, and he is the 2nd great grandfather to Craig Seaman current Vice Chairman of the Church. George W. Shaw was a Protestant Irishman, who moved into Long Lake in December 1842. He had lived in Addison County, Vermont a few years, but knew nothing about the woods or pioneer life and, what proved to be more serious, did not seem to be capable of learning. Although he worked hard he seemed to get hold of the wrong end of everything. Eventually though, with the help of his oldest boy Robert, a lad of fourteen, they cleared up a farm. He cleared the first twenty acres without a team, except occasionally the neighbors would have a work bee for him, sometimes logging an acre in an afternoon. After about five years of desperate struggling and hardships, pinching poverty moved out and Shaw began to look ahead to better times. The 1850 census shows him with his wife and 6 children. On September 10th, 1855, he was an original member of the Wesleyan Methodist Class formed of 32 members. Then George Shaw declared himself withdrawn from the Wesleyan Methodist Church on March 25, 1858. In the 1860 census he was with his wife and the three children remaining at home were, William H., George W. and Malissa M. All three were in school at that time. George’s real estate value was reported as $600, while his personal estate value was reported as $300. On September 24th 1861 he was elected Class Leader for the Wesleyan Methodist Church. On September 25th, 1864 he was elected teller for the annual conference of Wesleyan Methodist Church. Next, on April 15, 1865 he was chosen as a steward of Wesleyan Methodist Church. Later, on March 18, 1866, George Shaw and John E. Chase were chosen tellers, and the election of a delegate to the yearly conference was by acclimation. After balloting twice, John E. Chase was declared elected, George Shaw substitute. On the 1870 census he was with his wife Mary and son William, living in same house as Robert’s family. Mr. Shaw becoming old and his younger boys refusing to take care of the home turned it over to Robert and he spent the balance of his life with him, dying there on August 06, 1871 at the age of 72. He is buried in the Long Lake Cemetery. Mary Baskum Shaw, George’s wife was the mother of six children, an original member of the Wesleyan Church. Mary Baskum was born in County Donegal, Ireland about the year 1810. Their son, Robert Shaw, arriving in America in 1834 with his parents settled in Addison, Vermont, where the youth spent his boyhood days, going to school summer and winter until he was fourteen years old. In 1842 his name is on the list of pupils enrolled in Long Lake School in the month of December. Nothing remarkable could be observed in him, only his remarkable stupidity and carelessness, being a dull scholar, or rather lacking interest in his studies. He would rather spend his time tying strings in the girls’ hair or untying their apron strings. At all events when he stopped school he had not gone half way through Adam’s arithmetic. On the 1845 New York Census he is listed as an alien. The year of 1845 was a year of a severe winter and about this time he worked for William Helms at twelve dollars a month with an average production quota of two cords a day. In 1856, during one of many revivals held by Reverend John Todd and the members of the Congregational Church, Robert Shaw was converted and had espoused the cause of the church as avidly as he engaged in politics or business. In a year or two, he began to preach, working his way along the line of study, as per the rules of the Wesleyan Methodist Connection, to which he belonged. He was ordained a few years later, and served his local church as pastor for over a total period of fifty years, “never being deserted because he lacked interest”. But, being a politician and a lawyer, he sometimes offended portions of the people so they did not go to hear him for a time. But it was the vanquished that stayed away and it was usually disastrous to be in opposition. “He held the people to him to such an extent as has never been equaled by any other man in that place.” He held the office of supervisor for sixteen years, with but little interruption and when others were elected they were his choice as were the intervening pastors of the church. A Wesleyan Methodist Church meeting was called and held September 4th, 1857; a matter of difference having arisen between Brother Robert Shaw and Sister Betsy Catlin [later Betsy Ann Sabattis]. After several hours spent in talking and debating technical points the matter was settled by compromise over the points of Sister Catlin. Then both parties were required to forgive each other, which was done. Then the meeting closed with the best good feeling. At a Quarterly Conference held September 12th 1857 the Reverend Willard Alden in the Chair, Brother Robert Shaw applied for an “Exhorters Lycense”. He was then examined on principle and sometime after which, said “Lycense” was given. On September 19th, 1857, Leonard Dolph appointed by Conference came here and held a Quarterly Conference. After making arrangements for the arrival of Brother Dolph’s family, the Conference renewed the License of Reverend Robert Shaw to Exhort (preach), In the 1860 census he was with his wife and a boarder, he was a farmer, his real estate value $600, personal estate value $530. His boarder was James Rice, age 18; listed as being in school. James later married Paulene Houghton. In 1860 a decision was made to raise $250 to build a town house on ground proposed to be given by Robert Shaw from the southwest corner of his land on the highway west of James Keller’s property. In the fall of 1860, Robert sold his home and property for $2,000 to join James Keller in opening a store. In the latter part of 1857 there seemed to be a falling away in the church, called a relapse in religion. Some were tried and expelled, but no record was kept. All were distracted by the division in the church on account of the employment of Willard Alden, the preacher in charge. In March 1857 a meeting was called and a committee appointed to engage by correspondence a pastor for the coming Conference year. But preacher Willard Alden would not give up the ground as he had been hired until September 19th, 1857. This was a year of sore trial to the church and resulted in the loss of many of its members. On September 24th, 1861 he was elected steward of the Wesleyan Methodist Church. The special town meeting of 18 February 1862 was held at the Shaw and Keller store. At the last Quarterly Conference held the second week in July 1863, Robert Shaw was recommended to the yearly Conference by lot and a preacher was to be employed under his direction. Before 1864, Shaw had bought out Keller and was operating the store on his own. In 1863, Jones Ordway and his associates installed Henry D. Austin as a farmer at Eagles Nest, Blue Mountain Lake, NY. During his time at Eagle Nest, wolves and panthers prowled the nearby woods. There was a bounty on each of $5.00, and in that year four men qualified for the bounty, including Mitchel Sabattis. Town Meetings in February 1864 were held at the Shaw store. Again on September 25th, 1864 he was elected trustee for 2 more years of the Wesleyan Methodist Church. Then Robert Shaw took Asa Kellogg as partner and on February 7th, 1865, the annual town meeting was held at the store of Shaw and Kellogg. April 15th, 1865, he was chosen Chairman; Licentiate and Steward. By 1866, Shaw had bought out Kellogg’s interest and sold the store. Not long afterward, he bought out James Mulholland on the South side of the village and built a house, and a year later, a store 22 by 41 feet, two stories high. The establishment was in operation over 30 years. Albert Hanmer was clerk. Later, Ai Wesley Shaw, his adopted son whom Shaw put through high school, entered the business with him. Robert Shaw was Supervisor of the Town of Long Lake during 1862, 1866, 1867, 1869, 1872, 1875, 1879, 1883, 1884, 1886, 1887 (all one year terms). On August 12th, 1865, a committee was selected to go to Pittsfield, Mass. and elsewhere to solicit funds to build the Church. Those elected were Brother Robert Shaw, Mitchel Sabattis and James Keller. The Federal 1870 census shows Shaw with his wife Gitty M. Keller and their son, Ai Wesley, age 4. Shaw was listed as a minister with real estate value of $4,000; personal estate value of $2,000. His parents and brother William were living in the same house with him. A November 27, 1871 affidavit of Robert Shaw; Supervisor of Long Lake in regard to Patty Wood and her son William Wood, Robert Shaw reported that the claimant is a poor, needy woman. The 1872 Business Directory lists Robert Shaw as being the proprietor of a country store in Long Lake. In 1880, he was one of the first trustees of the Long Lake Cemetery and his occupation listed on that census is “preacher and farmer.” The 1880 census again shows him with his wife Gitty M., and son Ai W. now age 14. He again was listed as a Preacher and farmer. June 9, 1885 he was elected Commissioner of Highways at a special town meeting. The road from Long Lake to Essex County line was built in 1885. On December 12, 1888 he bought Lots #32, 33, 37, 83, 85, 96, 107, 108, and part of Lot #129 [west half] in Long Lake from Thomas W. McArthur, referee in foreclosure proceedings. Subsequently he sold these lots to Ostrander and Anderson. August 27, 1889 Trustees of the Wesleyan Methodist Church were Robert Shaw, Orello E. Boyden and John Lapell who bought land from Hannah Tarbell for the church. Hannah was the wife of Samuel S. Tarbell and they were parents of Mary who married Stephen D. Lamos. They were the parents of five children, all of who have strong connections with Long Lake and the Wesleyan Church. Lysander Hall, while not mentioned in our records was apparently a friend of Robert Shaw and in 1841 he was about five feet seven inches high, weighed about one hundred and thirty-five pounds, all sinew and muscle. On building a pier in the river on the Raquette Falls, below Long Lake, Robert Shaw, who had charge of the job, employed Hall to work. “Lysander could bear grief and fatigue, so far as physical torture was concerned, but not so when his mental strength or temper were tried. Then he flew all to pieces. He had a blow of gab equal to any two Dutch women in town and when the reader comes to learn the capacity for talk that some of them have, he will comprehend, by comparison, something of his power of gab, because there was often nothing but gab to his talk. There was not much power of conversation, but when the comic or ludicrous were themes he was a masterpiece”. According to Harold Hochschild, “Although the identity of the perpetrator was never legally established, suspicion of the scuttling (of the steamship Buttercup on Long Lake) centered by acclaim on Lysander Hall”. Gitty Keller Shaw, Robert’s wife had no children of her own. However, Ai Gitty (no explanation of his last name) of Newcomb, NY was adopted by Robert and Gitty Shaw sometime prior to the 1870 census where he is shown as being with them. Ai Wesley Shaw is the grand father of our Dubois R. “Buck “Stanton. Pauline M. Dumas, wife of William H. Shaw was the mother of five children and she died before 1910. Her husband William Shaw moved back to Bridport, Addison Co. Vermont and remarried. There are two other wives mentioned in the census, but no children or maiden names were mentioned. Mary Jane Shaw, daughter of George Shaw, and wife of Ransom Lloyd Palmer grew up in Long Lake, was active in the Wesleyan church. On November 6, 1859 Mary Jane and Ransom were married in Long Lake. At the age of 30, she and her husband moved to Minnesota in October of 1865 where he took up farming and they raised two children. Mr. Palmer lost an arm in the Battle of The Wilderness. When war broke out between the North and South, Mr. Palmer enlisted for the preservation of the Union in Company F, 2nd New York Heavy Artillery, and suffered a severe wound in the arm at Cold Harbor, which after twelve years of suffering necessitated amputation. He was listed as a Long Lake Guide boat Builder. For twelve years after his discharge from the army Mr. Palmer received a pension of $64 per year, and after his operation on April 4, 1877, when his troublesome arm was removed, his pension was increased gradually until it finally amounted to $55 per month. In politics, Mr. Palmer always voted the Republican ticket and he served his community faithfully and well in the minor capacities he was entrusted with. He was at one time the nominee of his party for the state legislature, and although his party was hopelessly in the minority, he was defeated only after a close contest. His firm convictions endeared him to his many friends and commanded the respect of his opponents. George M. Shaw, son of George W. Shaw is shown in the 1850 and 1860 census for Long Lake as being with his parents. We have no idea where he went from here, but do believe he married and had five children. Mrs. Christina Shunk, wife of Daniel was in 1855 an original member of LL Wesleyan Methodist Church and in the 1860 census she was with her son Francis F. Smith and family, she was listed as a boarder. Catherine Smith, daughter of John Keller and Margaret Phillips Keller, was also an original member of the Wesleyan Church. She was married to Francis F. Smith and mother of John James Smith. He was also an original and on April 13th, 1865 he was received into full membership in the Wesleyan Methodist Church. Peter and his wife, Julia Ann Van Valkenburgh, along with their daughter Lavinia were all original members of the church. Lavinia became the wife of John Lapell. They had eight children and their son Orren Barton Lapelle was the father of Ransom Lloyd Lapelle, who was the father of Lenora Seaman, Annie Sabattis, (current members of the church) as well as eight other siblings. Reverend Leonard Dolph was brought in from September 1858 through December 1858, in order to resolve problems that arose with the formation of a new church. There are references to Reverend Dolph being the head of the Champlain Conference, however, the list of Conference Presidents provided by the current district office does not show any record of this. Leonard Dolph was an interesting man, he and his first wife, Maria Taylor were the parents of 10 children. Maria Dolph died about 1840 in Moriah, Essex Co., NY. He married Mary Jeannette Ames on August 5th, 1843 in Moriah. Mary and Leonard then had eight more children. The youngest 3 of the 18 children were born in Long Lake. In December 1858 a church meeting had been called and held for the purpose of overhauling the old Class Book and forming a new one. All were notified that belonged or claimed to belong to the church to be present and help in the matter. Reverend Willard Alden took strong exception to the measure and he, his family and others did not attend. Consequently on the last Saturday and Sunday of the conference, there were two parties on the ground. Both claimed to be the church. Considerable excitement followed, out of which grew the trials of Brothers Alden and Dolph, which ended the labors of both. There is no record of any church or quarterly meetings at Long Lake until September 1861, when Reverend J. H. Harrington came as preacher in charge. A new class of 18 was formed. Reverend Willard W. Alden was pastor between September 10, 1855 and September 1858. He was one of the prime factors in the establishment of the church. Reverend Willard W. Alden was back as preacher in charge on May 15, 1860. Reverend J. H. Harrington served as preacher September 1861. Very little can be found regarding Reverend Harrington. Reverend Henry Harvey Barnes was pastor at Johnsburg Wesleyan in the 1860’s He then served the Wesleyan Methodist Church in Long Lake for two years 1862 and 1863. He held regular Quarterly meetings, but none of the records were to be found. He returned in 1870 and the census shows him with his wife and 2 children, occupation minister, RE value $1,000, PE value $150. At a special meeting of the Wesleyan Methodist Church, September 8, 1871, called by John Lapell and Mitchel Sabattis for the purpose of deliberating on the subject of dismissing Reverend H. H. Barnes as Pastor or preaching one half of the time, Reverend Robert Shaw was in the Chair; Orello Boyden was the Clerk. The motion being made and seconded to dismiss Elder Barnes from preaching any longer, the vote was taken. He was so dismissed and his pay for the time he has preached raised, and sent to him by Brother Sabattis. 1864 opened fair, with the Church all united. The Rev James (Jonas?) Scott was the preacher in charge. He did not arrive until after the first Quarterly meeting had been held, but when he came, he went to work. His wife Matilda probably joined him along with their daughter Emily, age about 9. Their son, W. H. Scott, would have been about 22. No other information is available. It was in 1865 that slavery was abolished by the 13th Amendment to the US Constitution, a goal that the Wesleyan Methodists had long been waiting for. On September 20, 1864 new members were received and the names ‘Lamos’ and ‘Cole’ appear for the first time. Some new members were taken in as full members and some on trial. In April 1865, some of these on trial were expelled and others received in full. In April 1865, Brother George Houghton was elected delegate to the yearly Conference to convene at Weybridge, Vt. Brother Robert Shaw applied for a recommendation to the Conference as a preacher and was recommended. The delegate was instructed that if the Conference did not select a suitable preacher to be approved by himself and Brother Robert Shaw, then he is to have Brother Robert Shaw appointed preacher for this charge. Reverend Robert Shaw was back at the pulpit during the 1865 to 1866 period, when the original church building was constructed. August 1865 a meeting was called and a committee selected to go to Pittsfield and elsewhere to solicit funds to build the church. Brothers Robert Shaw, Mitchel Sabattis and James Keller were chosen. An entry in the record under January 1, 1866: “Yesterday the first church ever built in the town of Long Lake was dedicated to the service of Almighty God by Reverend S. H. Foster, to the use of the Wesleyan Methodist of this place, known as the First Wesleyan Methodist Church of Long Lake. Other brethren had furnished most of the funds. The subscription was commenced by Reverend William Walden of Philadelphia and aided by Reverend Thaddeus Norris and his brethren of the Trinity M.E. Church of Philadelphia. The Reverend John Todd of Pittsfield and his church gave liberally in money, books, clock, and lamps. Many other contributions came from New York City, Albany and Troy. In April 20, 1866, a church meeting was called of the members. Brother Amos Hough and Sister Lavina Hough were arraigned for evil speaking and expelled by a committee composed of John Boyden, John Lape1le, Catharine Smith, Lydia Stanton and Alice Boyden. The church then voted to instruct the delegate to obtain the services of some preacher at the yearly conference to meet the next week at Stockholm (a town in Saint Lawrence Co. NY) From 1866 to 1869 nothing important is in the record except meetings were called to try members, who were expelled or reinstated. In May 1869 there was a Baptism by immersion service and those taking part received into the church: Hannah A. Dickenson Tarbe1l, Sarah Lawrence, Olive French (who became somewhat later, Mrs. Orello E. Boyden) and Lois Stanton. July 1870 speaks of Reverend Henry H. Barnes in the chair. At this time Sister Lamos was tried for buying goods on the Sabbath. She made a confession and also took back what she said about the church. She was “overlooked” (forgiven?) on the promise of better conduct. On Sunday April 30th 1871 baptized and received into the church were Elisa Plumley, Frank Wood, Franklin Emerson, Huldah Stanton, Thomas Sabattis, Rosellen Keller, Almira Keller, and Jane Plumley. Also received without baptism were Jeremiah D. Plumley and Charlotte Cole. 1- That Orello Boyden be appointed as a committee with the pastor in charge to labor with Brother George B. Stanton for neglect of Christian duty and to report at the next church meeting. 2- Brother Isaac Sabattis requested to be baptized next Sabbath. Resolved that we raise $15.00 to pay for bringing Brother Hull’s goods from Ogdensburg to Long Lake. In June 23,1871 the committee reported on George Stanton’s case. Motion made and seconded that his name be dropped from the class book. Isaac Sabattis received into the church in full connection. In July 1871, 3 trustees were elected (this is the first mention of trustees) Alonzo G. Mix-1 yr., John Lapell-2 yrs., Mitchel Sabattis-3 yrs. Brother Hu11 presented his official report of what he had received for the past month – $18.I7. Brother Robert Shaw was appointed to investigate the matter of buying a house and lot for a parsonage, and bring his report at the next meeting. On August 25th, Brother Robert Shaw reported no progress in obtaining a parsonage. It was resolved that he be retained till next meeting to continue to seek a parsonage. The Pastor reported he had received $13.74 during the past month. Business meetings continued each month; the pastor giving report of money received varying from $6.25 to $31.90. 2 Dancing – She pleads guilty to the charges and expressed a desire do better. But on questioning expressed a determination to withdraw the first opportunity, after which the following motion was made and seconded– to make the motion to expel her from the church. The vote was Yes -8— no-6. Afterward she expressed sorrow for her conduct, said she would attend church and class meetings and not try to withdraw from the church, after which the foregoing vote was reconsidered and resolved to accept her confession and retain her in the church. The 3rd charge was withdrawn by Robert Shaw, and she plead guilty of first 2 charges, and after some debate a motion was made and carried to expel her from the church and she was declared expelled from the church. On March 16, 1872- Brother Robert Shaw proposed to sell the lot to the church for a parsonage that lies opposite the meetinghouse. He offers to give up his entire claim against the church if they will raise $325.00 for him within the next conference year. He will give them a deed of the above named lot for a parsonage. A motion was made that the trustees enter into a contract for the purchase of the parsonage according to his offer, and it carried. Reverend John G. Hull, born in 1835, was Minister of the Gospel in the 1870 census, with wife and two children at Popes Mills, Town of Macomb, St Lawrence Co., NY. In May of 1871, Reverend John G. Hull became pastor at Long Lake and it was resolved that they raise $15.00 to pay for bringing Brother Hull’s goods from Ogdensburg to Long Lake. In 1873 district records show him with 54 members at Long Lake. Then on 4 June 1880 he was pastor at Burke, Franklin Co., NY Reverend Hull and his wife Mary were the parents of four children. In March 1873 it was resolved to hire Robert Shaw for preacher if he could be hired. Sunday School enrollment for this year was reported to be 70. Reverend Robert Shaw was back as pastor in 1873 through 1874. The next recorded meeting was in February 1874 with Reverend Robert Shaw chairman. In September 1874 it was resolved that the class book be revised, after the revision, there were 31 names found to be entitled to a place thereon. Hulda Stanton was one. In May 1875–Conference held at Moors and Reverend John H. Morris came to Long Lake as preacher. It seems he had been promised a salary of $250 to $300 per year. On February 11, 1876, a monthly meeting was held; this was the first mention of a hymn sing and when prayer was offered before business began. At a church meeting held November 4th, 1876, it was resolved that Brother John Lapell continue as a committee to labor with Brother Emerson and report at the next meeting. Resolved to appoint a committee to prefer charges against Sister Eliza Smith Plumley for making use of goods sent to the minister. Charles Bailey Hanmer was chosen for that committee and to notify her to appear at the next meeting and make her defense. Resolved that Robert Shaw be a committee to talk with Jerry Plumley and if he will not pay for the goods, then Reverend Morris is authorized to sue in the name of the church and try to collect the pay for it. Brother Morris reported that he has received $19.82 since the last church meeting. At the regular church meeting held December 2, 1876, Sister Eliza Plumley appeared and made a free and full confession of all the wrong that she had done, which the church unanimously accepted and the whole affair was dropped. Brother Morris reported receiving $4.66. Brother Boyden was chosen at this meeting as a committee to try to collect what remains due to Brother Morris from the stewards and others that have signed or agreed to pay, and to send him as his time is now up. The church agreed to make up with what was owed for this year. $100.00 was the amount he was to receive. He had received to date $66.34, leaving a balance due him $33.66. Reverend John H. Morris, born 1829, was in June of 1870 in Greenfield, Saratoga Co., NY as a farmer married to Charlotte and they had seven children ranging from nineteen down to two years of age. At the time he left Long Lake where he was pastor from 1875 through 1876 there was a total of eleven children in his family. On June 23, 1880 he was a pastor at Edinburgh, Saratoga Co., NY and at the age of 70 he was still in Edinburgh, but on the 1900 census is shown as a farmer living with his wife, son William and four grandsons. At the next meeting held April 1877, it was resolved first that we have preaching the coming year. Brother Lucius Henderson was elected delegate to the annual Conference with instructions to get a preacher from the conference if he can find a suitable one. May 9, 1877 was when Joseph Duane Russell got home from the conference where he was engaged to serve a charge for the first time, Long Lake, NY. On May 19th, 1877, he arrived in Long Lake and stopped with Brother Shaw who kindly informed him that he knew not of any arrangements having been made to provide Reverend Russell with a home, but Brother Shaw kindly invited him to stay with him for the present. Brother Shaw told Reverend Russell that he did not believe in holiness as taught by the “American Wesleyan” and “Bible Standard”. There were two copies of “The Wesleyan” taken here, one each by Brother Shaw and Brother Boynton; one alone the “Bible Standard” by Brother Shaw. June 1st, 1877, Reverend Russell said that he “was visiting and getting acquainted with the people on Sunday, the day that Mrs. Rice died. There was a peaceful end. She professed to be trusting in Jesus. How solemn it was, standing by her bedside and hearing her last words on earth to husband and friends: ‘We must all die’. Reverend Russell had somewhat peculiar thoughts of whether Heaven or Hell would receive her, but so calmly did she talk of going that he thought it was well with her.” June 9th, 1877, Reverend Russell said that he had been visiting at Sister Thayer and Smith’s. At the latter place, he saw Brother Daniel Smith’s eye and face badly swollen from the effects of a blow given by Jason Mead. June 10th, 1877 there was a dance at Mr. Austin’s! But, Rev Russell had just been visiting at Brethren Lapell and Emerson’s and enjoying a boat ride. Saturday, July 7, 1877, Brother S. Gordon, Mrs. Helms and her daughter, Sabbath schoolteachers attended a dance and took part. Sister Stanton then told Reverend Russell that he couldn’t stay a year here. This was meant as a friendly prophecy. Sunday, July 8th, 1877, when teachers were found out by Reverend Russell to dance and play cards, the Sabbath school voted to retain them as teachers. Reverend Russell had foolishly said that he would abide by their decision. So to cut the story short, Reverend Russell resigned, telling his reasons for doing so. Next Sabbath they met to reorganize and he felt that God would bless and prosper the school under brother Shaw’s supervision. Thursday, July 19th 1877, in company with Mitchel Sabattis he went to Holland’s, Blue Mountain Lake, by way of South Pond. Friday morning he went to the summit of Blue Mountain from a rude conservatory there erected per Colvin’s State Survey Company. Saturday, July 22nd, 1877 he went to Owl’s Head and enjoyed the rich Adirondack scenery, Marcy, Seward, Blue, Kempshal and Rock Mountains and others whose names he was unable to learn with Lakes Raquette and Forked, South Pond, Clear, Mud, Rock, Slim Pond and others. He asked that what he saw would lead him nearer God, who has so wonderfully and wisely created all things. Friday, July 27, 1877, was their first monthly meeting in which they appointed committees to look after Brethren Alva Cole and Frank Emerson, also Sister Paulina Rice. The church clerk and class leader promised to keep a record of attendance at monthly meeting and class meetings. It was agreed that Reverend Russell should have a home with Brother Henderson for a month to come. Sister Mandana Sheldon was received on probation, promising to conform to our Book of Discipline. (This possibly could be Mandana Lamos). October 22nd 1877 the state of things at Long Lake was such that on his arrival, he found that he had no home. For a week or more, he was going from place to place with no home and not knowing what to do next. He passed some houses on his way toward Lucius Henderson’s and stopped at a barn and slept. Now he went to Mr. McCluskley’s. Brother Joseph Duane Russell was the pastor named as chairman of the two next business meetings -­ October 27, 1877 and December 1877. According to Reverend Russell’s diary on October 30, 1877, two names were dropped. F. Emerson and Paulina Rice. It was decided that his salary was to be his board and clothes and whatever may be given him by the people, whereas he understood at conference that he would receive what the brethren Morris and Baldridge had – $250 or $300 each. Sunday, 9 November 1877 – He went to church early this morning, found cayenne pepper in the stove and on the pulpit floor (someone had come in the window). Friday, 14th 1877, while trying to cross Big Brook to hunt on the hills beyond he broke through the ice and dislocated his arm at the shoulder and came near perishing. It was a cold day and his clothing was soaked in water up to his middle. The pain was excruciating and his strength nearly gone when first he reached the shore. He reached the settlement where all who heard of his condition sympathized with him and administered unto his wants till Brother Shaw and Mr. Cole set his shoulder. His heart was nearly broken by their kindness and not a thing would any of them take in way of remuneration! Motion carried that he be discharged. December 27, 1877 – from J. D. Russell’s diary “Last night at church meeting appointed at Brother Shaw’s instigation, the church in an illegal manner, voted to discharge me from further service in their employ.” On New Year’s Eve, Brother Russell went to Brother C. R. Harrimore’s. Then on the 1st of January 1878 he sent out a letter to the President of the Champlain Conference, Brother R. E. Johnson, stating conditions of things and asking him to withhold Sanction of Proceedings till he had thoroughly investigated. February 28th, 1878 he left Long Lake. He passed through Newcomb on his way to Johnsburg or wherever God the Spirit led and he stopped at Josiah Houghton’s. When he left Sister Smith’s that morning, it seemed like leaving home. He could hardly keep from crying like a baby. Sister Smith and daughters sobbed as though their hearts were breaking. Sister Smith, on leaving, put a dollar bill into my hand; may God bless her. At Johnsburg he helped his father make sugar through the season after which he attended the conference at Morley, St. Lawrence Co., NY. He was left without an appointment at his own request. Sunday April 30th 1871 B F Emerson was baptized and received into the Wesleyan Methodist Church. In 1883 He and Livonia Stanton Emerson built a farmhouse on the road between Deerland and Long Lake village where they took in a few summer boarders. 1899 was the beginning of the Long View Cottages; currently known as the Long View Lodge and Restaurant. Brother Benjamin Franklin Emerson and Brother Jeremiah D. Plumley were received in the church in full connection at the meeting in April 1878. It was then resolved that the church pay to Sister Smith $14.00 for boarding Brother Russell, the former pastor. C .B. Hanmer (Big Charlie) was elected delegate to conference. It was resolved to have a minister the coming year. Charles B Hanmer was a Civil War veteran having served first for a year with Co. C, 93rd NY Infantry. After receiving a disability discharge, he enlisted for a 2nd term at Long Lake with Co. K, 1st NY Light Artillery, with which he served until the close of the war. After the war he resided in Long Lake, Hamilton Co., NY where he worked as a guide. 29 November 1878 – C B Hanmer’s name removed at his request from the Wesleyan-Methodist roles. He is mentioned as Justice of the Peace in 1879. He died in 1921 and is buried in the Long Lake Cemetery. That Mrs. L A (Lodisa Aurelia Allen) Stanton act as a committee in seeing to the cleaning the church. Mr. F. Persons act as a committee in seeing to getting the church wood. That Walter Dean Jennings be our sexton for the remainder of the year. That Brother Hathaway’s license to preach be renewed. That Brother Hathaway be recommended to the Annual Conference for Elders Orders. That Orello E. Boyden be elected delegate to the yearly Conference. That we invite Brother Hathaway to serve this church as pastor another year. Adjourned for four weeks. Reverend Winfield S. Hathaway was here in 1878 until 1880 when he left to go to the Wesleyan Church in Johnsburg, Warren Co., NY and where he is shown as pastor on 16 Jun 1880. On the 5th of June 1900, he was pastor at Dickenson, Franklin Co., NY. In the 1910 and 1920 census he was with his wife in Orange County, Vermont and shown as a farmer. In February 1880, it was resolved that there be a corresponding committee of three to correspond with ministers concerning preaching here the coming year. Orello E. Boyden, Walter Dean Jennings and Robert Shaw were that committee. To give Brother and Sister Hathaway a letter of recommendation to the Wesleyan church at Johnsburg. That we answer the letter we received from Brother Bartman about preaching here the coming year and tell him we will make the final arrangements at the Conference. That Brother Hathaway was recommended to the Annual Conference for Ordination. That Brother Hathaway’s license to preach was renewed. That Mrs. Charles Hamner and Walter (age 13) Hamner’s names be dropped from the church record by request. This was mother and son. Walter Hamner and his wife “Nellie” moved to Wyoming for a short while, but moved back after several years to spend the rest of their days at Long Lake. Resolved that we accept Brother Shaw as preacher in charge the coming conference year, and that be shall be paid a good suit of broadcloth clothes and a pair of fine boots for services as preacher this year. Leroy Persons was elected committee to collect money to get the clothes. Brother Lucius Henderson re-elected class leader for the coming year. Resolved that Orello E. Boyden, Leroy Persons, and Simeon Cole be stewards the coming year. Both Reverend John Bartman and Reverend Winfield S. Hathaway left Long Lake to go to Johnsburg. The Bakers Mills Wesleyan Church, in the town of Johnsburg, was an offshoot of the Mill Creek or Garnet Lake Wesleyan Church. Enos Putnam formed the Mill Creek Church about 1856. As population concentrations changed, the Mill Creek Church fell to disuse. The original classes in Bakers Mills were outreaches of the Mill Creek Church. In more recent years the Bakers Mills Church demolished the Mill Creek Church and used the lumber etc. in improving and expanding their church. December 1881­ (6 mo. later) a meeting was held and the following business done. Orello E. Boyden and Mitchel Sabattis were elected to the corresponding committee to correspond with ministers concerning preaching the coming conference year. Resolved that Simeon Cole be appointed committee to collect money for buying a suit of clothes for the minister. Reverend John Bartman was born 1822 in South Hero, Grand Isle, VT. On the census of August 21, 1850 for Queensbury, Warren Co., NY he is shown as a Lawyer and married to Cornelia O. Adam. July 26, 1870 he was the pastor at the Mill Creek Wesleyan Church, Garnet Lake Rd., Johnsburg, NY. Reverend Bartman came to Long Lake in 1880 and stayed through 1881 when he moved back to Johnsburg, NY. The June 1880 census shows that he was an unemployed circuit preacher prior to coming to Long Lake and that his daughter Lotty, age 17, had some sort of disability. In June of 1890 he is shown on the Civil War Veteran list for Warren County and in Johnsburg in the 1900 census. His wife, Cornelia died January 16, 1890 and is buried along with him in the Mill Creek Wesleyan Cemetery, Johnsburg, Warren Co., NY. He died on September 29, 1908. Accept pastor’s report of receiving $161.56 during the past year. To give Brother Lazarus a recommend to the conference for Elders Orders. That Sister Lydia Stanton be appointed committee to raise money for the purpose of painting the church building. Hannah Hough), Wm. Mix, Chas. Sabattis and wife in regard to their neglect of duty in attending church, and doing things contrary to church discipline; this committee also was to labor with Sister (Sarah Zobeda) Hough, John Plumley and Sr. Emerson. October 6th, 1883 it was reported that Sisters Plumley and Emerson had settled the case between themselves. At a quarterly conference held May 24, 1884, the Reverend Robert Shaw was elected Sunday School Superintendent and Mr. Bostock assistant. This was the first time Sunday school was mentioned in the record. Mr. James W. Bostock was a Civil War Veteran – Co., H., 9th NY Heavy Artillery. He died at age 69 on August 6, 1905 and is buried in the Long Lake Cemetery. His wife, Abigail apparently was committed to the Utica State Hospital for the Insane as reported on the April 23, 1910 census for that location. At a meeting on January 10, 1885 it was resolved that we leave the preaching for next year to be supplied by the conference. Next meeting, April 1886 – the pastor’s name not given. Reverend Lazarus was there from 1882 until 1884 and Reverend Blanchard seems to have arrived in 1886. Reverend John Lazarus was born in June of 1837 in England. His wife Catharine came from Scotland. The 15th of June 1880 census shows him, his wife and two sons in Mooers Village, Clinton Co. He was photographer before they arrived in Long Lake in 1882. At a quarterly Conference held the 24th day of June 1882, Brother Lazarus was received into the Church in full connection; Sister Lazarus received into the Church by letter from the M E Church of Mooers, Clinton Co., NY. In 1883 our district records show 25 members and then Rev Lazarus left in 1884, to return in 1890. His wife was on the Apr 1888 list of donors for paint for the Wesleyan Methodist Church. Reverend John Blanchard did not leave much information for us to find. He was pastor of the church in 1886 through 1890. During this time, Reverend Dr. Bushnell a summer vacationer from New York took up subscriptions among his acquaintances and purchased our first parsonage and lot, owned in 2005 by Wesley Cornish on the Newcomb Road and across from South Hill Road. February 24th 1887 it was resolved to invite Brother John Blanchard to serve the church as pastor. A committee was appointed to correspond. April 16, 1887—Brother Truman Bills and wife, Assenith were received into the church in full connection by a letter from the church at Bakers Mills. Truman Bills was brother to William Bills, a pastor in Indian Lake. Reverend William Bills was married to Catharine Gallop, sister of Sarah E. Gallup, great grandmother of the author, Raymond W. Smith of Long Lake and first cousin, three times removed to Morrison John (Hoss) Hosley, Jr. former Town of Long Lake Supervisor. October 15, 1887–the following brothers were received into the church in full communion—Harlon R. Seaman (31); John Helms (30); Amos Hough (22); David Hough (20); Ai W. Shaw (22); Emelon Stanton (19); Harry Sabattis (21); Eveid (Everett) Boyden (15). Resolved that Truman Bills (48) have license to exhort from this church. Brother Murray came to the USA in May of 1888 and almost immediately became superintendent of the estate and preserve of F. C. Durant, of Philadelphia. PA. After retirement he lived in Long Lake and on December 15, 1893 he moved into the house next to the Wesleyan Methodist Church. Margaret Murray, his daughter married Joseph Duryea Sabattis, she operated “Murray’s Variety Store” at that location for many years. It was between the current “Corner Motel” and our parsonage. At a meeting held March 30, 1889­ it was resolved that H.L. Salisbury be Chorister and Orello E. Boyden and Isaac Sabattis assistants with power to invite anyone to assist in singing or playing that they think best. (This was the first time music is referred to although we do know that Mitchel Sabattis did play the violin in church). August 27, 1889 the trustees were Robert Shaw, Orello E. Boyden and John Lapell who bought land from Hannah Tarbell for the church. Orello E Boyden was by this time one of the main people in the church as well as in the community. In the year 1890 through 1892 he was the Supervisor of the Town of Long Lake. O E Boyden died on 25 August 1892 and is buried in the Long Lake Cemetery. On May 1st 1890, by motion of Brother Hough the minister’s salary was fixed at $300.00 with the parsonage. At a meeting September 14th, 1891, a resolution was passed that this church will remodel its membership, making a complete new list, that any members who shall not have attended class in the past 18 months shall be left off the membership list after the next quarterly conference, and the pastor shall give three public notices of the same prior to the next quarterly meeting. Reverend John Lazarus again served Long Lake from 1890 to 189­1. He is listed as a member of the W M Church on April 1895. The 1900 census shows him in Olive, Ulster Co., NY shows him as a minister with his wife. He was then in Olive, Ulster Co., NY on June 12, 1900. He died and was buried in the Long Lake Cemetery in 1907. His son Arthur H. Lazarus and two grandchildren are also buried in the Long Lake Cemetery. At a quarterly conference meeting held June 18, 1892 – among the motions made and carried was that Newcomb be supplied with preaching from this place each Sabbath at 4 o’clock unless otherwise appointed. Resolved that Sister Boyden and Sister Seaman be stewardess for the purpose of seeing to the necessary arrangements for the Lord’s Supper. (1st mention of Lord’s Supper.) Resolved that Brother Bostock be our sexton and that he be paid quarterly at $25.00 a year for such service. Resolved that Brother Bostock be Sunday school Superintendent. September 24,1892: moved and carried that we rescind the vote to supply Newcomb with preaching by Brother Wright. The district list of churches, pastors & members for 1893 shows the church in Newcomb, NY with R. Shaw Pastor and 19 members. It was at this time that the Wesleyan-Methodists of Newcomb purchased the Methodist Episcopal Church. Reverend Shaw served for five years as pastor. During this time, parsonage construction was begun, a horse shed was constructed and a new bell was installed. The bell was a gift of Reverend Shaw, a belfry and steeple were built, all the interior of the church was repaired, and new pews and a pulpit were installed. All free of debt because $2,000 had been raised for these items. During this time the church had as many as 40 members. Three revivals were held, including one in which Reverend W. J. Houghton, was the evangelist. Houghton College is named after him. On November 1, 1893, a Ladies’ Society was organized. Mrs. Helen Bissell opened her home to an egg party for the benefit of The Wesleyan Ladies Aid Society on November 9th 1893. Reverend William Rist and Reverend Charles Fox served during the years 1898 to 1908. This Wesleyan Methodist church of Newcomb disappeared from the records of the Champlain district of the Wesleyan Methodist Church after 1903. The Troy Methodist Episcopal Conference was requested to provide a pastor and Edward T Radley; a local preacher arrived in Newcomb on July 4, 1908. At a meeting held March 25, 1893 — motion made and seconded that the names of Isaac Sabattis, Alba Cole, Arline Sabattis; Nancy Sabattis, David Hough, and Amos Hough be continued on the church book another quarter and then dropped unless they take an active part in meetings. Reverend Fred L. Wright arrived in 1892 through 1896 and district records show 39 members. June 24th, 1893 at that time, there was a proposition called for from Brother Wright in regard to salary. Brother Wright proposed that we furnish him a good living, keeping for his horse and firewood. This proposition accepted. According to Champlain Conference records in 1893, Long Lake had a Sunday school attendance of 103 in 3 schools. December 23rd, 1893 Brother J. Houghton was elected corresponding committee to inquire about a pastor and on January. 17th, 1894 Brother Houghton gave the corresponding Committees report, having gone all through the town and found that all, or nearly all of the people are in favor of having Brother Wright remain another year. He has not written or corresponded with any ministers. He has also taken a paper with him on his visits and has had signed $243.00 to pay the minister for another year. Brother Wright was invited to remain another year, invitation accepted. District records show him pastor in 1893 with 39 members. Meeting held March 31st, 1894, the chairman, Brother Wright, told of the offense of Brother Calvin Town and read his letter asking to have his name dropped from the church book and to resign his office of trustee. It was resolved that the case of Brother Town be left over till next quarterly meeting. Resolved that a committee consisting of Brother John Helms and Andrew Murray see Brother Towns and talk the matter over with him. Brother Mitchel Sabattis was on hand and explained his case, and was given until September to get the $10.00 and use it for the Lord’s work. The chairman now explained Brother Charles Sabattis’ case. Brother Sabattis acknowledged his sin, asked the Lord and the church to forgive him and pray for him and he said he would try to do better in the future. It was resolved that the church accepts Brother Sabattis acknowledgment, forgive and bear with him. On June 8th, 1894 the report of Brother Murray and Brother Helms given by Brother Wright, notes having seen Brother Town and made everything all right. Brother Town will stay in the church. On September 28th, 1895 and on request, a vacation was voted for Brother Wright for 2 weeks. (This the first vacation mentioned.) Brother Wright revised the list of members. In April 1895, Robert Shaw, Lettie M. Seaman, Gitty M. Shaw, John Lapell, Mary Ann Keller, Josiah Houghton, Mitchel Sabattis, Eva Shaw, Betsey Sabattis, Hulda Stanton, Mrs. Mary (Duryea) Robinson, Calvin Towns, Wm. M. Mix, James W. Bostock, Charles Sabattis, Mrs. Chas. Keller, Zobedia Plumley, Mrs. John (Rozilla M Plumley) Robinson, John Lazarus, Benjamin F. Hall, Mrs. John Lazarus, Mrs. Jessie Hall, Fannie E. Helms, Mrs. Howard Hamner, Ai W. Shaw, Mrs. Harriet Henderson, Mary Shaw, Emlon Stanton, Mrs. Josiah Houghton, Wm. H. Cutts, Evid Boyden, Andrew Murray, Agnes Murray, Harlon R. Seaman were the members listed. Isaac B Closson Robinson was one of the first settlers of Long Lake, a native of Vermont, who followed the Mix brothers to Long Lake. He settled on a bluff on the west side of Long Lake, opposite Pine Island. Isaac Robinson was a very prominent man in town, having been supervisor, Commissioner of Roads, Justice of the Peace, besides holding other minor offices. In the early times his word went for law among a majority of the inhabitants of the place. When in his prime, he used to lay stonewalls for Mr. Chase and, as often as once a week, took his pack full of provisions and carried it home to his family. In 1869 Adirondack Murray cited him as a Long Lake Guide. Then in 1874 he appeared on Cyrus Kellogg’s list of independent guides in the Long Lake area. The 1880 census shows him with his wife Christina Keller Robinson and 4 children, 3 grandchildren and Alice B. Sutton age 19. On the evening of January 10th, 1896 a special meeting was called for the purpose of making the corresponding committee report and act according to disciplinary rules. The committee reports having corresponded with Brother Howard and Brother Warner and ascertained that either of them can be secured if the place is vacant. After much talk, Brother Shaw resigned the office of corresponding committee. Brother Seaman was then authorized to follow the disciplinary rule and ascertain the feelings of the church in regard to keeping the present pastor or getting another. Brother Benjamin Hall volunteered to canvass the town on the west side of the lake outside of the church and John C. Robinson volunteered to canvass the east side and report the same to the corresponding committee. The last meeting in the record was held March 29,1896­. Luther J. Houghton, John Murray, Archie T. French, were received into the church by vote on probation for 6 months. Emeline Town was received in full communion. Letter from the Newcomb church received Fannel Stone. On motion Brother Wright is invited to remain another year. His answer was to be given on the following day. Reverend John Quay served the Plattsburgh Wesleyan Church according to the census record of 26 July 1870. Then on 17 Jun 1880 he was pastor at the Wesleyan Church at Chazy, NY. He arrived in Long Lake as pastor in 1896 and was here through 1900. He went from Long Lake to Stony Creek, NY, where on the 20 June 1900 census, at age 70, was still listed as a clergyman. Walter Dean Jennings left the Wesleyan Church and was one of the first trustees of the Methodist Episcopal Church of Long Lake. At the 21st of Jun 1899 meeting at Forrester’s Hall, the M-E Church appointed him to solicit subscriptions. Walter D. was instrumental in the building of the Mt. Sabattis Masonic Lodge and the Calvary Methodist Church established in 1900. Reverend Charles E. Fox on the June 12, 900 census is shown with his wife, Sarah Wilson Fox and two children in Long Lake. The April 20, 1910 census also shows them at Long Lake with three children and the Wesleyan record shows them there until 1913. However, the 1920 census shows him, his wife and two daughters in Colonie, Albany Co., NY working as a machinist at a Valve Works. District records show Reverend William Rist, as Pastor of a Newcomb Wesleyan-Methodist church with 32 members. In the census of Jun 6, 1900 he is listed as a 48-year-old clergyman at Newcomb living with a 17-year-old girl, Jennie Hitchcock, as a boarder/servant. District records show S. H. Stokes as pastor in 1903, with 63 members and Newcomb is shown with William Rist as Pastor with 32 members. Then again in 1909 through 1911 the district records show Rev S. H. Stokes as pastor. This is during the time when, in 1910, the town of Long Lake first authorized the macadam paving of the village road. Reverend Almanson J Allen served the Long Lake Wesleyan church from 1905 to 1909. He was born in Montague, Lewis Co., NY; father to Glendora Allen Bump, Bessie Allen Lamos and Vera Allen Lewis all with connections to Long Lake. Glendora Allen married Charles Malcolm Bump and they were parents to Evelyn Bump married to Reverend Harold M. Austin, Jr. Rev and Mrs. Austin are the parents of four sons, including the current Long Lake Wesleyan pastor, Kevin Austin. Bessie Allen married Merritt B. Lamos and they were parents of eleven children; most of who have strong connections to Long Lake and the Wesleyan Church. Aldis M. Lamos, Ralph C. Lamos and John T. Lamos were Wesleyan Pastors. In 1920 Reverend Allen was pastor at Chazy Wesleyan, Clinton Co., NY. Between 1920 and 1929, Rev Allen was Conference President of the Champlain District of the Wesleyan Church. On May 1, 1927, Reverend A. J. Allen, while the Conference President preached both services in Long Lake following the destruction of the church building by fire on April 15th, 1927. He further served in that position from 1935 through the 5th of October 1936. As reported in the Adirondack Enterprise, “Nine persons narrowly escaped death when fire destroyed a three story dwelling and Wesleyan Methodist Church at Long Lake with a loss of $20,000. Reverend Verian Dare Otis served from 1913 to 1920 as Pastor and in 1914 he is shown with 36 members. In the 1920 census he is shown with his wife Carrie, 2 sons and with an occupation of caretaker at private camp in Long Lake. October 1915, the church building was repaired and rededicated under Reverend Verian D. Otis. Historians often describe the 1920s as a decade of contrasts and conflicts. Freedom in dress, behavior, and sexual attitudes clashed with a new Puritanism. On the other hand, religious fundamentalism underwent a rebirth, as people tried to latch onto the traditional moral standards of bygone years. Overall, the decline of the Anglo-Saxon class as the most influential group in American society characterized this time period. Even as the power of the Anglo-Saxon establishment was on the wane, one of its final attempts at holding onto control was the passage of national Prohibition. In January 1920, the Prohibition amendment went into effect. Almost immediately the New York – Canadian border came alive. New highways to New York and Vermont sprang up almost overnight. Route 9 from the Canadian Border to New York City became knows as the “Rum Trail.” As border patrols increased, the smugglers were forced to find alternate routes to the big cities, one of which was from Rouse’s Point, through Long Lake, Blue Mountain Lake, Indian Lake and on to North Creek. The alternate route took them through Newcomb and Minerva. At the railroad head in North Creek, buyers from the city either met the smugglers or they would smuggle the booze onto the Delaware and Hudson Railroad, which made its final stop at North Creek and then returned to Albany and points south. A central point in North Creek was Bissell’s garage where smugglers transferred the goods to the gangster’s vehicles. The bootleggers drove the fastest cars available during that time period. Pierce Arrows, Packard’s, Cadillac’s and Auburns were a common sight on the streets of North Creek during Prohibition. They really stood out, as most of the residents either walked or owned Fords or Chevrolets and a few farmers still traveled by horse and wagon at that time. April 15, 1927 Good Friday, the Long Lake Wesleyan Methodist Church burned. On April 17th, 1927, Easter Sunday sunrise services were held at 6 am. Church and Sunday school was held in the Methodist Church. Also evening services program for Easter was by the Wesleyan Methodists. August 25th, 1927 a Prayer meeting was held at the Wesleyan Methodist Church, in the new building. The scripture reading was by Mr.Wyman. At the August 21, 1927 dedication of the Wesleyan Methodist Church and parsonage, construction was under the pastorship of Reverend Varian Dare Otis. The Sermon was by Mr. Carpenter. Mr. Otis was a Veteran of WW I as shown by the monument in front of the Long Lake Central School. He and his wife divorced in the 1930’s. She then went on to live with and eventually married Lewis Alexander Duane of Long Lake. She and Lewis are buried in the Long Lake Cemetery. Mr. Otis died in Plattsburgh, Clinton Co., in April of 1976. Reverend William Osgood, son of Nathan Osgood, was born July 1877 in Machias, Cattaraugus Co., NY. He lived and was brought up there until some time after 1900. He died May 18, 1961 in Bakers Mills, Warren Co., NY. He married Mable (Mab) Barber about 1898. She was born 24 February 1878 in NY, and died 1961 in Bakers Mills, Warren Co., NY. Her burial was in the Long Lake Cemetery, Hamilton Co., NY. They had four children, the oldest of which was the Reverend Dennis Osgood who married a local Long Lake girl, Clara Belle Parker. Clara Parker was an older sister to the former Hamilton County Sheriff, Art Parker. After he retired, Dennis Osgood and Clara moved back to Long Lake and lived in the house currently owned by the Shamrock Motel. It is located across the street from the motel and next to M. J. Hosley, Jr.’s residence. Reverend Dennis had a strong temperance message that was frequently given in the evening services at the Long Lake Wesleyan Church. William Osgood is shown as a clergyman on the 1910 census in Pennsylvania. Then he was a pastor in 1920 living on the Moriah Rd., Stockholm, St Lawrence Co., NY. Between 1921 and 1922 he was pastor at the Long Lake Wesleyan Methodist Church. Then his occupation is shown on April 2, 1930 as a salesman for a Dry Goods Store in Hadley, Saratoga Co., New York. He died at Bakers Mills, Warren Co., NY and is buried with his wife in the Long Lake Cemetery. Reverend Charles A. Heath born about 1879 was pastor at Stockholm, St Lawrence Co., NY during the census of 1910. From there he went to Bakers Mills, NY as pastor and then he arrived in Long Lake in 1923. The district records show a membership at that time of 22 with average Sunday school of enrollment of 30 and average attendance of 25. He was in Long Lake through some time in 1927. On 16 April 1927, the Church building burned. Rev Heath was married to Blanche and they had two daughters, Ethel and Eldonna that would have been thirteen and eight respectively at the time they arrived in Long Lake. In the 1930 census he is shown with daughter Eldonna living in Ballston Spa, Saratoga Co., NY, employed as a Methodist Minister. Reverend Howard Rollman, son of William and Margarete Rolman of Hadley, Saratoga Co., NY and the youngest of five siblings, moved to a Commercial Hotel in Corinth at the age of 18 and became a finisher for International Paper Co. He, his wife Katie and their 3-year-old son Howard Jr arrived in 1928 as pastor in Long Lake where he served at least through 1930. Reverend Gerald R. Hewitt born on Cortland St., Glens Falls, Warren Co., NY about 1907. He lived there through the 1930 census where he was shown as a laborer in a mill. He served the Long Lake church from 1940 through 1945. The 1943 district records show him as Pastor with 48 members. In 1945 he was pastor of the Norfolk Wesleyan Church. In 1961 he was the pastor at the Hague Wesleyan Church and then he died on 21 May 1961 at the Moses Luddington Hospital, Ticonderoga, Essex Co., NY. The funeral services were held in The Hague, NY. He and his wife Vina had three children, Reginald, Geraldine and Goldie, all born in the early 1930’s and most probably attended school in Long Lake. Reverend Ray Lyle Morgan was the son of Edson Harrison Morgan, a lifelong member of the Norwood Methodist Church. Ray Morgan was born September 9, 1906 in Norwood, St. Lawrence Co., NY, and died December 10, 1991 in the Champlain Valley Medical Center, Plattsburg, Clinton Co., NY. He was pastor of the Wesleyan Church in Morley, Ellenburg Depot, Long Lake, Heuvelton, Hadley and Colton, NY. He was pastor between 1950 and 1955 at the Long Lake Wesleyan Methodist Church. The 1953 district records show that at that time he had 32 members. His funeral service was by the Reverend Lloyd Stuart, District Superintendent of the Champlain District, Wesleyan Church. Burial was in the Riverside Cemetery, Norwood, St. Lawrence Co., NY. He married Marion E. Blodgett on Apr 14,1928 in Norwood, St. Lawrence Co., NY. She was born September 7, 1910 in Etowah, McMinn Co., Tennessee, and died January 5, 2000 in the United Helpers Nursing Home in Canton, Saint Lawrence Co., NY. Carol Morgan, m. Lorne Gage. Carol Lamos, daughter of Sheriff Merritt and Mrs. Lamos of Lake Pleasant, became the bride of Dale Richard Wilson, son of Mr. and Mrs. Clarence Wilson of Slingerlands, October 4, 1952 at 10 a.m. in the Wesleyan Church, Long Lake. The Reverend Aldis M. Lamos, Philadelphia, a brother of the bride, officiated, assisted by Reverend Doyle, Albany, and Reverend Morgan, Long Lake. 1953 was the year that Route 30 was paved from Northville to Long Lake. Clifton L Chapman born July 3, 1909 and lived in Brookdale, St Lawrence Co., NY until he married Claris Rita Winslow on May 6, 1932. Reverend Clifton L. Chapman served at Long Lake from 1955­ to 1970. The 1963 district records show Reverend Chapman as Pastor with 37 members. The 1967 district records show him as Pastor with 31 members. He is the father of Carl and Ralph Chapman, both Wesleyan Ministers. Clifton Chapman, Jr. died in 1996. The Reverend Reginald Byron Hewitt, Conference President of the Champlain Conference Wesleyan Methodist Church of America, opened the Centennial Service of the Long Lake Wesleyan Methodist Church, 1955, with a prayer. Clifton L. Chapman was the pastor in charge during this celebration. Former Pastors of this church sang a special song and they were: Reverend George Jock, Reverend Howard Chapman, Reverend Gerald Hewitt, Reverend C. Lawrence Hill and the Reverend Ray Morgan. Others in attendance were Rev Ralph Seaman and Reverend Jesse Russell. Although it was not found in any records, according to the former Long Lake Historian, Jessie Stone’s notes, she was informed by one of the older residents that the first Cemetery was on the west side of the current Wesleyan Church and through the efforts of W. W. Durant, land was purchased and deeded to the town, and the graves were moved to the present cemetery. When the town was laid out, there was a certain amount of land in each township set aside for Gospel and School land. Any proceeds from timber on those lots were to be used for church or school. This original lot is said to have been at Forked Lake, near Plumley Pond. On Mar 6, 1932 Jesse Russell started teaching the boy’s class. There were four boys in the class. The 13th of March 1932, Jesse Russell had nine in his class; from this class eventually came 3 ministers from the Seaman family and 3 ministers from the Lamos family. There were many other Christian men that became leaders in the church. Lucius Russell, his older brother, later taught this class. July 22, 1934 was Reverend Howard H. Chapman’s first Sunday as pastor. Reverend Chapman served from 1934 to 1940. Reverend Howard Chapman with son, Harold Chapman in the car. Reverend Howard H Chapman, son of Edwin S Chapman, was born on the 5th of September 1902, and died Oct 1975 in West Chazy, Clinton Co., NY. He is also brother to Clifton Chapman, father of Ralph and Carl Chapman; all are or were Wesleyan ministers. Reverend Howard H Chapman served as pastor on the 2nd of Apr 1930, at the Horicon Wesleyan Church, Warren Co., NY. His first Sunday as Pastor of the Long Lake Wesleyan Church was on July 22nd, 1934 and he remained here through 1940. His residence on the 11th of February 1971 was at Chazy Landing, Clinton Co., NY. He married Lucile A. Ramie who was born 1901, and died 1951 and is buried in the Long Lake Cemetery, Hamilton Co., NY. In the 1930 census Lucile was with her husband; 3 daughters and a boarder, Walter S. Clark age 26, a schoolteacher in a private high school. Harold Chapman, Missionary to Sierra Leone. Pauline A Chapman, living in Schenectady in 2005. 1966 Joyce and Marty Bozak were serving as lay missionaries to Sierra Leone in West Africa. Joyce is the daughter of Jesse Leroy Russell, member of this church in the 1930’s who went of to be a minister. Reverend Jesse Leroy Russell was the son of Lyman Russell 1858-1936. Jesse’ brother Lucius and their nephew Lyman Russell were the donors of the window in the church. Their uncle Joseph Duane Russell, brother to the senior Lyman Russell was pastor of the Long Lake Wesleyan Methodist Church in 1877. In 1968 there was an official name change from Wesleyan-Methodist Church to Wesleyan Church as a denomination. At that time, the Wesleyan Methodist and the Pilgrim Holiness Churches merged. Reverend Robert Brusso, former TV personality and member of the Elizabeth Street Wesleyan Church in Plattsburgh, NY, was ordained at West Chazy, NY on the 9th of July 1970 and served in Long Lake through the 9th of July 1978. Reverend Bob Brusso died in his early fifties on 26 Mar 1991. Reverend Laurie Greenlaw, originally from New Brunswick, Canada served from July 10, 1978 through July 11, 1995. He has been serving the Millerton Wesleyan Church, PA from August 21, 1998 through the present. Reverend LeRoy Bannister served in Long Lake from July 12, 1995 through July 20, 1997. Reverend William J. Nace served in Long Lake from July 20, 1997 through July 9, 2000. He currently is serving as the Pastor of the First Wesleyan Church, Cumberland, MD. Reverend Dennis Croy started on July 10, 2000 and concluded his service here on July 9, 2004. He is currently serving in Michigan. Reverend Kevin Austin, son of Reverend Harold (Bunny) Austin, started serving Long Lake on July 10, 2004. He returned to Long Lake, where he graduated from high school in 1976, to take on the duty of pastor at Long Lake Wesleyan Church. Kevin and his family returned from Europe in the fall of 2003, where he and his wife were serving as missionaries in Germany and then the Czech Republic since 1991. The Austins moved to Houghton, NY in 2007, where Kevin is the Womens’ Basketball Asst Coach. Christopher Humby took over in June/July 2008. The Humbys left in January 2012, when Chris was offered a position at Mendon Church as the youth director. Reverend Harold (Bunny) Austin served as our Interim Pastor. In May, 2012, Dr. John Gocke and his family came from Jamestown NY to join our church family and serve as our Pastor. 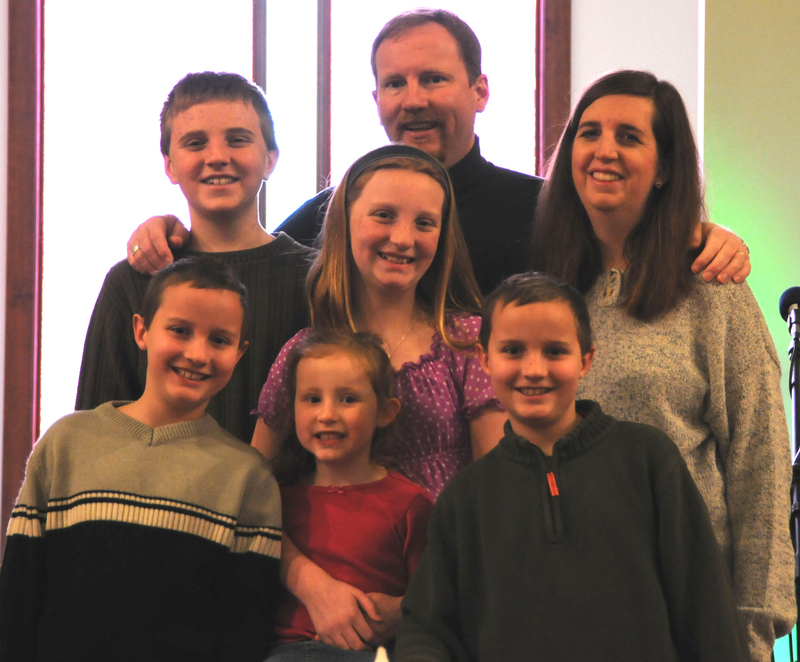 Pastor John and Amy have six children: Lance, Emma, Peter, James, Sarah, and Abigail. Updated January 21, 2013, with input from Raymond Smith.